• The Generals play game 2 of a 5-game series in Montgomery tonight at Riverwalk Stadium…Jackson is coming off back-to-back series victories at HVL (3-2) and vs. BIR (3-1)…have won 6 of 9 overall…will play 14 games with Montgomery over the course of the final 45 games, 9 coming at Riverwalk Stadium. 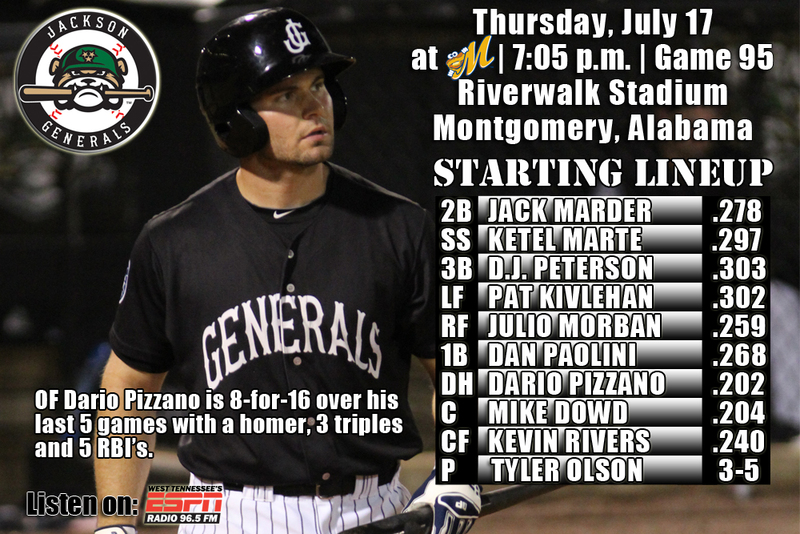 • The Generals dropped the opener of the series at Montgomery on Wednesday night, 7-0, being shutout for the 8th time this season. • LF Dario Pizzano (2×4) and D.J. Peterson combined for 4 of Jackson’s 8 hits on the night. • Montgomery posted 5 runs in the first inning and 2 runs in the fourth against starter Matt Anderson (L, 3.2,9,7,7,1,3) who suffered the loss. Relievers LH Kyle Hunter (1.1,2,0,0,0,1), RH Trevor Miller (2.0,1,0,0,0,5) and RH David Colvin (1.0,0,0,0,0,2) held Montgomery scoreless for 4.1 innings behind Anderson. • OF Dario Pizzano currently has an eight-game hitting streak and is batting ,500 (8×16) with 5 runs, 3 triples, a home run and 5 RBI over his last 5 games. His average has jumped from .163 to .205 during hit streak. • July by the numbers – After batting .294 as a team in June, the Generals are currently batting .280 in July, which ranks 1st in the league. The 12 July home runs ranks 3rd in the league and 7 wins is T-3rd. • Montgomery leads the league with 20 home runs during the month of July. They are batting just .229 as a team this month, but are 8-6 and have a team-ERA of 2.93 which is second in the league. • INF Dan Paolini has hit safely 11 of 12 games appeared in July, batting .372 (16×43) with 7 runs scored, 4 doubles, 3 home runs, 9 RBI and 2 walks. • OF Dario Pizzano has hit safely in each of his last 8 games, batting .429 (12×28) with 7 runs scored, 2 doules, 3 triples, 1 home run, 10 RBI and 4 walks. • 3B D.J. Peterson has hit safely in 15 of 16 games with Jackson, batting .303 (20×66) with 8 runs scored, 4 doubles, 3 home runs, 7 RBI and 4 walks. • In 2 relief outings since coming up from A+ High Desert, RH Matt Brazis has faced 1 over the minimum in 7.1 innings. He gave up a solo home run to Greg Hopkins in his first outing which was the only hit or run allowed. He has walked 1 and struck out 6 so far. • RH Richard Vargas has appeared in 8 games since the All-Star break going 1-0, and is 3-for-3 in save opportunities, not allowing a run in 9.0 IP. Vargas has walked 4 and struck out 10, while giving up just 2 hits holding opponents to a .063 AVG (2×32). This is after going 0-1, with a 6.12 ERA in the first half going 2-for-4 in save opportunities walking 24 and striking out 30 in 32.1 IP.